March is almost over and April is right around the corner! There is so much going on this holiday weekend that it may feel overwhelming. But fret not, here are some special hand-picked events for you to enjoy! So in between family gatherings or screenings of Ready Player One on 70mm at the Music Box, there is something for you to enjoy! Now let’s get on with your curated weekend! SO WHAT: Hungry for Stories is growing a community committed to reading outside of their comfort zones. 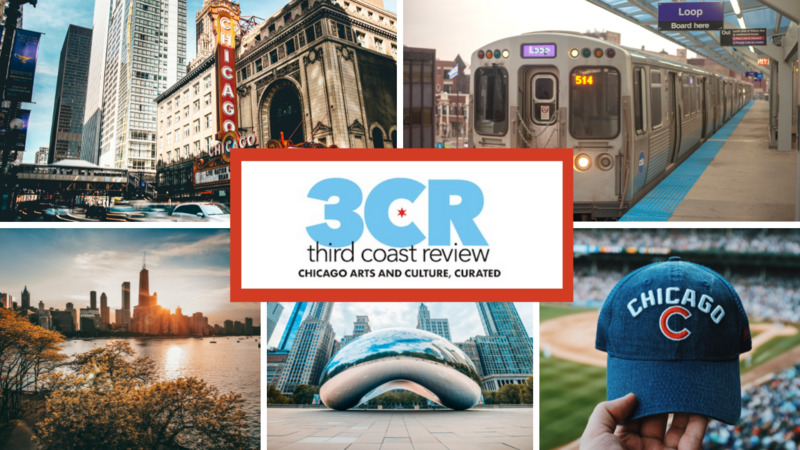 For this edition at the Read/Write Library, editor of Rust Belt Chicago: An Anthology, Martha Bayne will discuss the collection of fiction, essays, poetry and more “required reading” for understanding the place we’re in now. NOW WHAT: Entry is $10 suggested for the public and all attendees are welcome to actively participate regardless of subscriber status. This discussion is free for current Hungry for Stories subscribers and their guests. If you’d like to join the subscription book club, you can do so on their at their website. SO WHAT: Ever since Son Lux evolved from Ryan Lott’s solo project to a collaboration with band mates Rhafiq Bhatia and Ian Chang, the band’s sound has become grander and more engrossing. Their latest album, Brighter Wounds, continues the group’s sweeping sound and highlight’s their immense talent. Joining them will be Sinkane, whose electrifying stage presence and undeniably groovy sound will have you dancing in no time, and the wonderful and soulful voice of Hanna Benn. NOW WHAT: Tickets are only $20 for this amazing show! NOW WHAT: Tickets are still available an are only $20! SO WHAT: NightStop makes incredibly scintillating synth music that will leave you on the dance-floor for hours on end. He will be putting his amazing Dancing Killer on vinyl with No Trend Records and this release party is sure to be a blast with fellow synth masters Pixel Grip and Spaces of Disappearance! NOW WHAT: Tickets are $7 for this show! WHAT: A stellar lineup that you shouldn’t miss! SO WHAT: Emily Jane Powers has been making some of the most lush and intimate bedroom pop for over a decade and her latest album Restless adds a sense of collaborative polish to her amazing sound. Joining her at this record release show will be the unwavering voices of Half Gringa, Jessica Risker, and Fran. NOW WHAT: Tickets are $8 in advance and $10 the day of show! SO WHAT: The Western Elstons make music that mixes classic honky tonk, western swing and rockabilly into a fun and exciting performance. Just looking at the members of the band should be enough to lure you into their sonic bubble as the band features Scott Ligon (guitar and lead vocals), Casey McDonough (guitar, keyboard and vocals), Joel Paterson (pedal steel guitar), Jimmy Sutton (upright bass and vocals), and Alex Hall (drums)! NOW WHAT: It’s a $5 cover for this musical journey that you need to be on! SO WHAT: Dusek’s will be setting up in the field behind the church to help their neighbors keep the grounds beautiful, followed by an egg hunt. Prizes are kindly donated by some of your favorite Pilsen-area businesses including Cafe Jumping Bean, 606 Records, Thalia Hall, and more! They’ll also have a special appearance by the Easter bunny. NOW WHAT: Stop by, help, hunt for some eggs, then head over to Dusek’s for brunch! You can make reservations at their site! WHAT: Links Hall’s annual benefit, THAW is celebrating the 5th anniversary of their partnership with Constellation at the shared venue in Roscoe Village. SO WHAT: Both theater spaces will be utilized with dynamic performances programmed by Links Hall and live music programmed by Constellation’s Mike Reed. There will be local food trucks, craft brews and cocktails during the event and an official after-party at the Hungry Brain! NOW WHAT: Tickets start at $65 for general admission and there are VIP options which offer an exclusive lounge at the American Heritage Fireplace showroom, specialty cocktail service designed by Land and Sea Dept and catering by Parson’s Chicken & Fish. SO WHAT: Paul Cherry has been working on his new album over the past two years and it’s finally ready for aural consumption! The songs are the trippy and smooth throwbacks to jazzy R&B that only Cherry can provide. Come celebrate the release of Flavour on Feel Trip Records along with some incredible friends of Cherry like the amazing Anna Burch and Divino Niño. NOW WHAT: It’s a free show, so don’t miss this excellent album release party! SO WHAT: It honestly doesn’t get any more glam as The Gold Web. This band of winged, glittered, and face painted musicians mix their gonzo theatrical stage shows with some flashy and utterly catchy songs. The band is hypnotizing as they churn out surreal synths and manic beats. They are a must see local band and this opportunity should not be missed! They will be joined by Strange Doll Haus! NOW WHAT: It’s a free show and if you RSVP you get 20 free game tokens! Go, go, go! SO WHAT: It’s the Opening Day for Wolff’s Flea Market at Allstate Arena! Peruse the rows upon rows of sellers offering up all kinds of merchandise! WHAT: It’s an Easter Egg Hunt, but for adults (that means drinking)! SO WHAT: It’s another year of eggs, whiskey, and charitable good times. Team registration starts at 11:00am and then the hunt around Logan Square goes from noon – 2:00pm to find as many eggs as you can and afterwards there will be a block party full of food and music back at Longman & Eagle from 2 to 4:00pm where the eggs will be counted and winners will be declared! Prizes will include some great Easter egg baskets with tons of local establishments donating swag! NOW WHAT: Register in advance – and don’t wait, last year’s hunt sold out well in advance. The fee per two-person team is $10 ($5 per person) – all proceeds will be donated to One Tail at a Time.